What preventative measures are being taken in terms of police and firefighters' mental and emotional care? Yoga For First Responders (an organization I'll introduce you to shortly) notes that roughly 25 to 30 percent of police officers experience stress-related health concerns, and an estimated 18 percent of police officers and up to 37 percent of firefighters experience PTSD (post traumatic stress disorder). That said, emergency responders have also been noted to develop a high level of resiliency to trauma through finding purpose in the heroism of their work. Nevertheless, given the data, an obvious question surfaces: What preventative measures are being taken in terms of police and firefighters' mental and emotional care? Recently I had the pleasure to speak with Kansas City, Missouri, firefighter, yoga teacher, and ambassador for Yoga For First Responders, Essie Marie Titus. 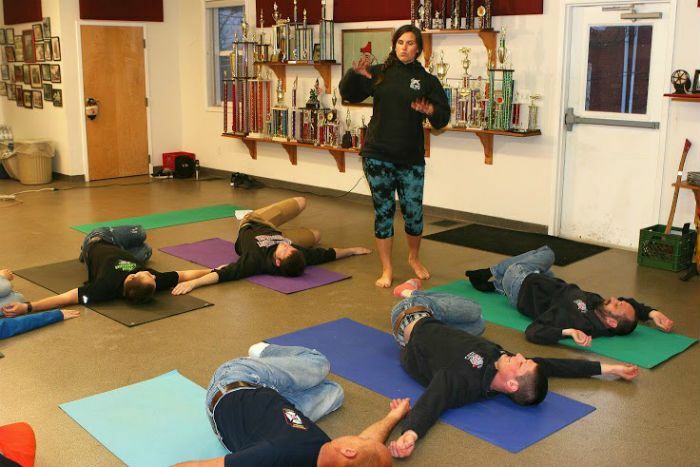 Yoga For First Responders (YFFR) is a newly developed nonprofit which serves to introduce first responders to trauma-sensitive yoga and resiliency training. Lately, Titus has been spreading the word about YFFR far and wide (teaching YFFR classes at Yoga Journal LIVE, kind of far and wide). She’s also been working to establish much needed dialogue on trauma among emergency personnel (something she states hasn't traditionally been explored). And given what she's been through (more on that later), from my perspective, her new endeavor seems quite miraculous. Titus with the Honesdale, PA, Fire Department. But how did Titus' synthesis of “firefighter/yoga teacher” come about? Titus says that she believes this might well be her dharma (life's purpose). 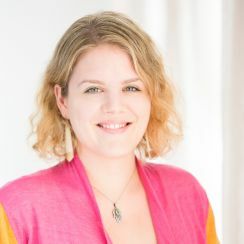 After leaving the retreat center, she sought training that would enable her to teach yoga to other first responders who were perhaps in a similar situation as she had been (coming out of trauma, or deeply entrenched in it). That's when she discovered Yoga For First Responders at the Sedona Yoga Festival. Titus told me that as far as she knows, YFFR is still the only nonprofit organization which offers yoga to first responders. Titus teaching yoga to Honesdale firefighters. 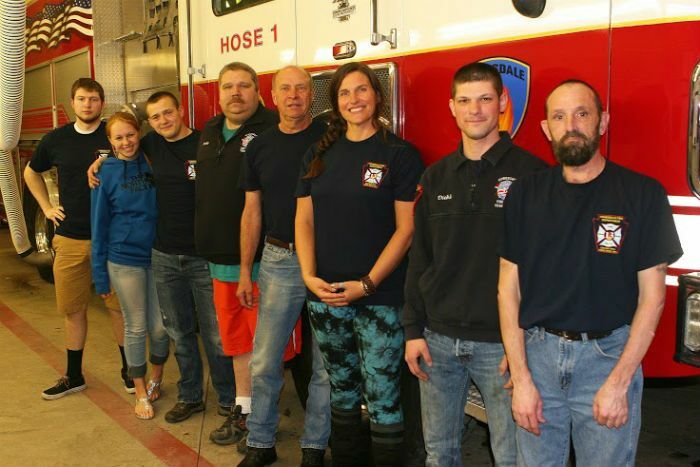 One of her strongest goals is also to reconnect firefighters and other first responders with the community in which they serve. To facilitate this communication between first responders and community members, she's currently planning community events such as cookouts, yoga classes in the park, art installations, and fundraisers, all of which she feels just might pave the way toward compassionate communication and much needed trust (something Titus feels has been lost, evidenced by the numerous recent civilian shootings at the hands of police officers, as well as the increasing number of attacks focused on law enforcement).